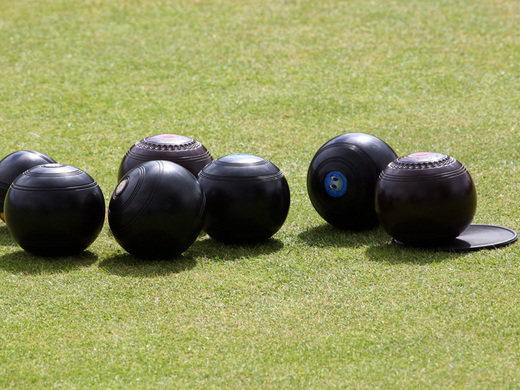 Bowls was played in Exmouth at Phear Park in 1910, the Phear Park Bowling Club being founded in 1925. 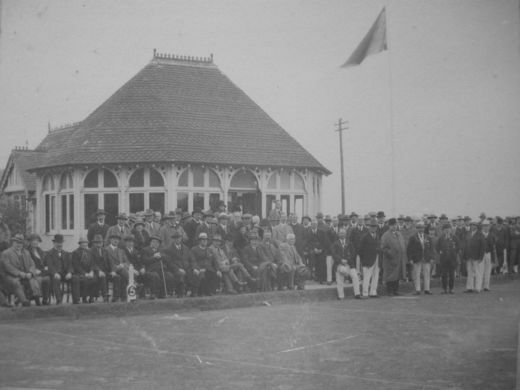 In that year the popularity of Bowls in Exmouth was well-established and a meeting was held at Thorns Hotel to discuss a proposal to found a properly-constituted private club in suitable surroundings. Support for the proposal was enthusiastic, financial guarantees were offered, so East Devon District Council was approached with a view to leasing a ground. The Council offered the suitable site of Thorns Recreation Ground, Madeira Walk, which had the advantage of a substantial pavilion. On 3rd November 1925 at the first AGM of the Club Mr F S Wilson was in the Chair. 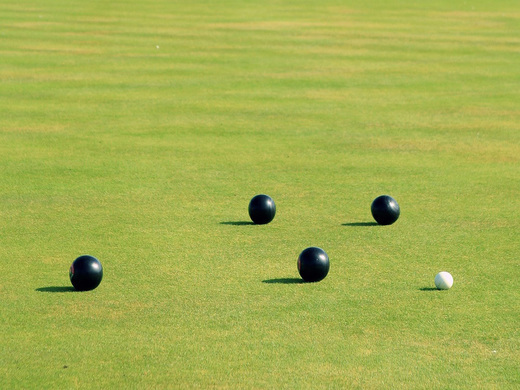 He was pleased to report that the financial position was good and the first turf had been laid that day and so the “Exmouth Madeira Bowling Club” was formed, the official opening of the green being 8th May 1926 and the Club’s first Captain being Mr H Blackmore. The annual playing subscription was fixed at 2 guineas. 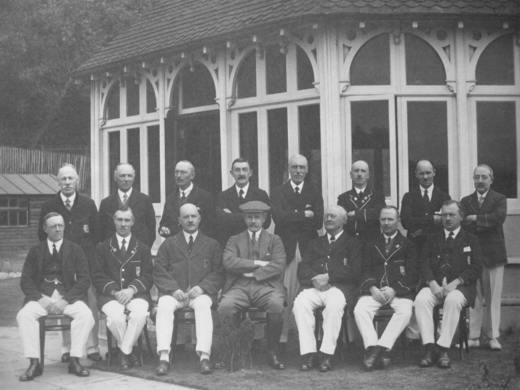 The club went from strength to strength, winning the Devon County Trophy for the first time in 1930 and its success seemed assured to the extent that a second green was laid. This was opened by Mr Alf Alley, President of an Australian Touring Team which played Devon County at Madeira on 10th June 1930. In June 1934 it was proposed that a Ladies’ Section be founded at Madeira and this was led by Miss Jessie Blackmore and had an initial strength of 7 members. A small hut was provided as a dressing room and, in the cause of modesty, was sited with the windows facing the surrounding bank of the Club ground! Also in 1934, the Club’s first Open Tournament was held and proved to be a great success attracting bowlers from far and wide to meet in friendly competition. The event has developed to the extent that last year, the 78th Open Tournament, over 160 competitors took part. Madeira continued on an even keel and in 1939 the men won the County Trophy for the second time. 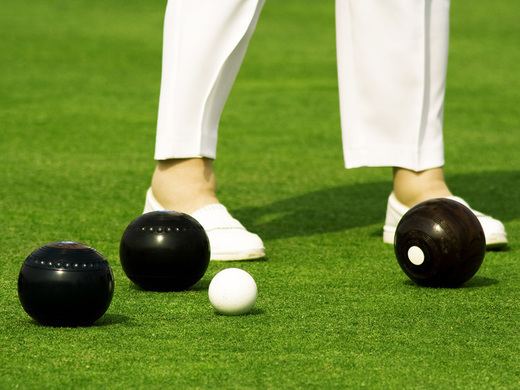 Bowling activities were curtailed during the war years but the greens remained open for play, although entertainment was restricted due to rationing. 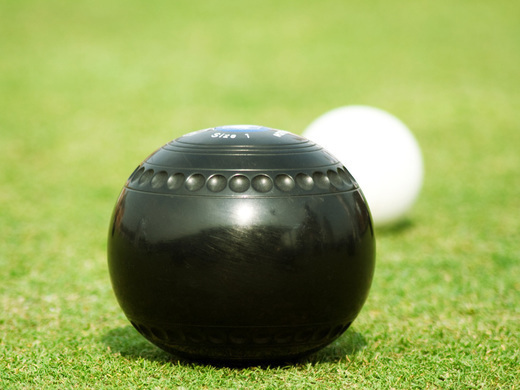 By 1979, the possibility of indoor bowls for Exmouth was being considered. 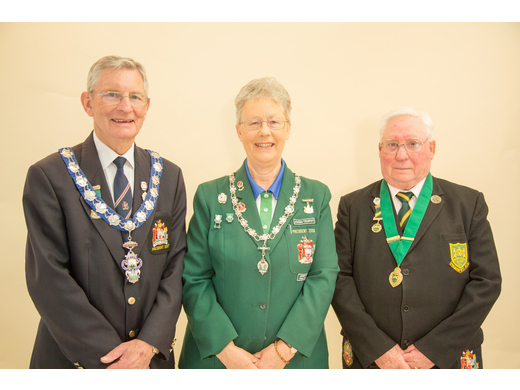 This was an independent project led by H T Baldwyn of Madeira and members of Madeira and Phear Park Bowling Clubs. 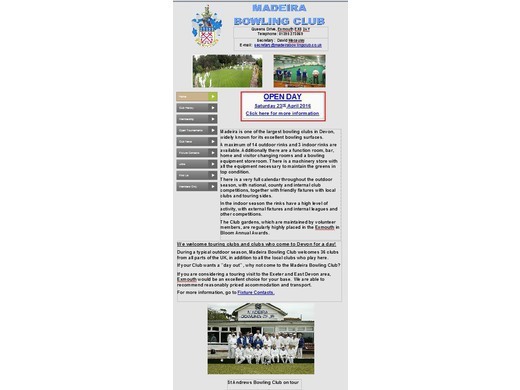 This was in the days before the National Lottery and funds of near £85000 had to be raised by gifts and loans from Madeira and Phear Park members, local council finance and a whole host of fund-raising events plus a bridging loan from the Madeira Bowling Club. 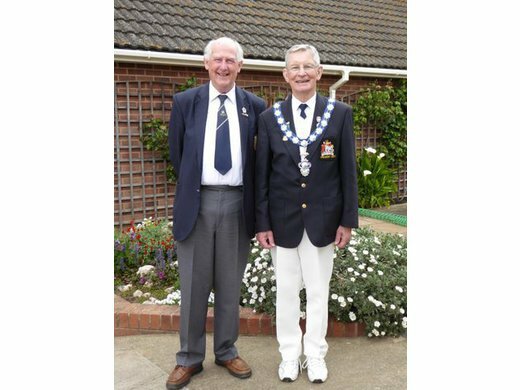 The Exmouth Indoor Bowling Club was opened on 21st November 1981 by Mr Baldwyn as the first Chairman. The subscription was £8 with rink fees of 35p and a cup of tea 6p plus 2p for biscuits! The Indoor Club used the Madeira Bowling Club facilities free of charge until 1986 was it was agreed to pay £2000 pa for the privilege. Membership was usually about 300, peaking at 340 in 1988 by which time the Indoor Club had become debt free. In 1994, Mr Bob Burch, Chairman of the Indoor Club approached the Madeira Bowling Club with a view to forming a single Club. The proposal was agreed and many committee hours were spent on details and the formation of revised rules. 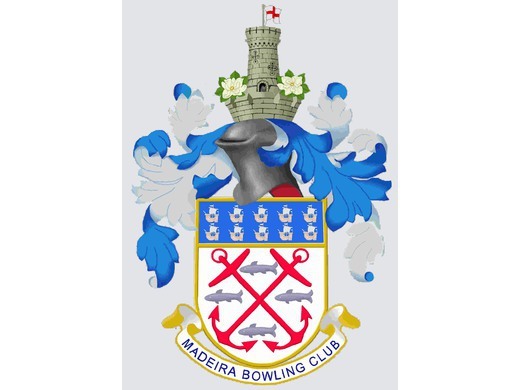 On 19th August 1997, Bob Burch, now President of Madeira BC presided over an AGM at which it was agreed that the Indoor Club be dissolved on 10th October 1997 with its assets transferred to the Madeira Bowling Club. The Club has faced many challenges over the years flooding being one of the most significant in 1960, 1972 , 1981, early in the life of the Indoor Club when the bowling hall was flood to a depth of 18 inches or so, and again in 1990 when a new carpet and underlay were laid paid for by the insurance company! Early in the new millennium, the iconic “Octagon” pavilion, which had been built in the 1870s, finally creaked with its heavy roof being too much for the timber walls and the members of Madeira bowling club faced a huge fund-raising challenge to replace it with the Magnolia Room transforming the clubhouse facilities to what they are today. 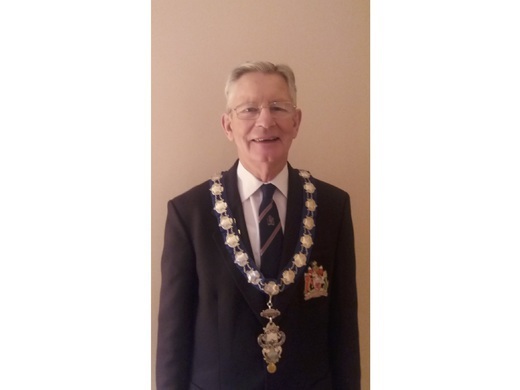 Throughout all these challenges, the good spirit within the club has ensured its success, a huge amount of work within the clubhouse, on the greens and the surrounding gardens being done by an army of its members.